A cataract is a misting or clouding of the lens of the eye, and is something that most people over the age of 60 develop as an age-related process. Other causes include the previous use of steroids, trauma (e.g. accidental damage to the eye) or a medical condition such as diabetes. The eye is rather like a camera. There is a front clear window (the cornea) and a little way behind this and the pupil, lies a structure called the lens. This usually clear structure plays a very important part in focussing light onto the retina at the back of the eye. The retina corresponds to the film in a conventional camera, and is responsible for transmitting visual information to the brain. As we age, the lens becomes cloudy and less light is able to pass through, giving the effect of looking through frosted glass. It also loses the ability to focus light sharply on the retina. Cataracts cause a gradual and progressive blurring of vision. They can alter the focussing properties of the eye (requiring more frequent changes of spectacles) and also cause glare around bright lights (e.g. car headlights or the setting sun). Sometimes people notice a change in colour appreciation, or that things appear duller. 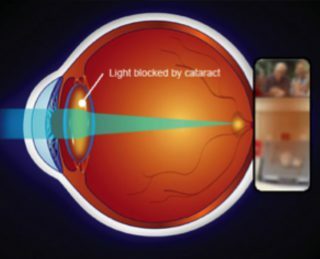 Patients often comment that everything is much brighter and sharper and that colours appear much more vivid following cataract surgery. Your optician is usually best placed to detect signs of cataract. This may be during your routine annual eye examination, or if you attend specifically because you have noticed the symptoms described above. Opticians often refer patients directly to an ophthalmologist (ophthalmic surgeon or eye surgeon). Cataracts do not always require surgical treatment, but advice should be sought if you are experiencing any of the symptoms described above. Our experienced Face & Eye consultant ophthalmic surgeons will remove the cataract (the central cloudy part of the lens) and replace this with a clear plastic lens (an intraocular lens or IOL). This operation, when performed by an experienced surgeon, is relatively quick and usually very successful in restoring vision. This is one of the most frequently performed operations in the UK. At Face & Eye, our surgeons use advanced micro-incision surgical techniques, with the latest in replacement lens implant technology. Face & Eye’s very experienced consultant eye surgeons will remove the cataract (the central cloudy part of the lens) and usually replace this with a clear, plastic lens. 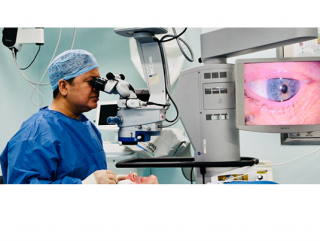 This operation, when performed by an experienced surgeon, is relatively quick (usually taking under 15 minutes to perform) and usually very successful in restoring vision. This is one of the most frequently performed operations in the UK. Click here to watch a cataract operation being performed by Mr Kanawati. At Face & Eye, our surgeons use advanced micro-incision surgical techniques, with the latest in replacement lens implant technology. We are also able to offer you the most advanced accommodative and multifocal lens technologies depending on your individual needs. Cataracts cause a gradual and progressive blurring of vision. They can alter the focussing properties of the eye (requiring more frequent changes of spectacles) and also cause glare around bright lights (e.g. car headlights or the setting sun). Sometimes people notice a change in colour appreciation, or that things appear less bright. Your optician is usually best placed to detect signs of cataract. This may be during your routine annual eye examination, or if you attend specifically because you have noticed the symptoms described above. Cataracts do not always require treatment, but advice should be sought if you are experiencing any of the symptoms described above. When is a cataract treated? If the cataract has progressed to the point where it is interfering with your vision, then surgical removal may be advised. Cataracts do not need to have progressed to a particular level of “maturity” before surgery is indicated. Modern techniques allow us to operate as soon as the cataract is impairing your vision to a level where it is affecting your lifestyle. Sometimes your vision may be reduced to the point that it no longer meets the legal standards for driving, and therefore surgery may be required. There is no proven method for preventing cataract development and no proven treatment other than surgery. However, as cataracts frequently develop with age, it is important to have regular eye examinations, as we get older. This should be done preferably through a dilated pupil every 1 – 2 years. Your optometrist or eye surgeon may also be able to detect signs of other conditions such as glaucoma and age-related macular degeneration. The operation itself will take up to 10-30 minutes depending on the complexity of the case. However you may need to be in the clinic for up to 3-4 hours. You will need someone to collect you following the operation. After the operation you will rest for a while and have refreshments. You will be given a dressing pack to swab the eye clean the following day, and some antibiotic and anti-inflammatory eye drops to apply at home after the surgery, for a couple of weeks. You will be asked to apply a Cartella shield at bedtime for 2 weeks to protect your eye. Click here to see how to apply the shield. Your vision will be blurred for a few days while your eye heals. It is usual to feel some discomfort until your eye settles but there should be no pain. Any discomfort can be relieved by taking paracetamol. After a couple of days you will start to notice a significant improvement in your vision. You will see the surgeon again after 1-2 weeks and will visit your optometrist for new glasses after 4-6 weeks. You can quickly return to many everyday activities, although heavy lifting or other strenuous activities should be avoided for at least a week. The healing eye needs time to adjust so that it can focus properly with the other eye, especially if the other eye has a cataract. Ask your surgeon or optometrist when you can resume driving. What will my vision be like after my eye has healed? Once you have been given your new glasses, you may notice that everything seems a lot brighter than you remember. Colours may be sharper and may have a blue-ish tinge. Or, in bright sunlight you may feel you are looking through rose-coloured glasses. These colour tinges are normal and are because you are now looking at the world through a clear lens that is no longer cloudy. Within a few months your brain will get used to your new clear vision and these colours should go away. If you have cataracts in both eyes, the surgeon will not usually remove them both at the same time. You will usually need to have each done separately, although they can both generally be done within about 2-6 weeks. Your Consultant has performed thousands of cataract operations. Face & Eye ensures that the technology and products used for the surgery are of the highest standards available. Although the vast majority of patients achieve excellent results without complications, it should not be forgotten that cataract removal is a surgical procedure. As with all forms of eye surgery, cataract removal has risks and whilst we make every effort to minimise them they cannot be totally eliminated. Retinal Detachment – this occurs when the retina detaches from its normal position and can result in severe loss of vision if surgical correction is not successful. The approximate risk of a retinal detachment in the general population is 0.01 % per year. Someone who is hyperopic has a smaller risk than this, whereas a myopic patient has a slightly higher risk than this. Infection – every time there is an incision made in an eye for any reason it is possible to get an infection inside the eye which has the potential to cause severe visual loss. This problem is extremely rare and our rate of endophthalmitis is less than 0.1%. After the cataract operation, to help protect against infection, eye-drops are prescribed which must be used as directed. Bleeding – there is a small risk of a serious peri-operative bleed either in the orbit, or within the eye. Macular Oedema – is an accumulation of fluid at the central retina which can cause temporary or permanent reduction in vision after surgery. The postoperative eye-drops also help to reduce this risk. Floaters – are often noticeable immediately after surgery but usually become less noticeable with time. Posterior Capsule Opacification (PCO) – is thickening of the residual lens membrane which supports the lens implant. Approximately 25% of patients will, at some stage, notice a reduction in their vision due to PCO. It may occur months or even years after surgery and is easily and quickly dealt with by outpatient laser treatment using a YAG laser (a YAG laser capsulotomy). A refractive “surprise”. This refers to an unexpected optical error following the surgery. Prior to surgery you will undergo a test referred to as biometry. This uses a computerized ultrasound device that measures your eye to determine the correct power of intraocular lens required. This is very accurate but very rarely the lens selected does not provide the desired visual outcome. This might require further surgery to exchange the lens or corneal laser surgery to correct the error. Other possible complications include tearing of the lens capsule (<1%) which could mean that it is more difficult to implant an intraocular lens. There are other extremely rare complications which your surgeon can discuss with you prior to surgery. The lens implants we use are left in place for life. Once you have a replacement lens implant (intra-ocular lens or IOL as it is called) you cannot develop another cataract in that eye. However, it is quite common for the membrane that holds the lens in place to develop some cell re-growth in the first 18 months after surgery. Should this occur, it is easily and painlessly removed in seconds using a small laser beam in the surgeons consulting rooms. This technique is called a YAG laser capsulotomy and is a simple outpatient procedure. Will I need a referral from my GP or optometrist? Your GP or Optometrist can refer you for treatment. Once you have been referred you can call us to schedule your initial assessment appointment with your surgeon. This depends on the the how this is undertaken and what type of intraocular lens is used. Please note that although cataract surgery can be performed under local anaesthesia alone, local anaesthesia with safe, conscious intravenous sedation given by a very experienced and skilled consultant anaesthetist (commonly referred to as “twilight anaesthesia”) is also available where requested. This form of anaesthesia is extremely popular with our patients and the effects are reversed very quickly. It enables local anaesthetic injections to be given painlessly with little recollection of the surgery, and helps to keep patients calm, relaxed and comfortable. Any patients requiring general anaesthesia or who are unsuitable for surgery at our day case facility, the Face & Eye Clinic, will be treated by our surgeons in a local private hospital e.g.the new Private Wing of Manchester Royal Eye Hospital (The Manchester Centre for Vision) or the BMI Alexandra Hospital Cheadle.